I been home from Davis for almost two days now, and it's probably been the busiest two days I can think of. My dad has made listing projects he wants me to work on almost an art form. Lucky for you, that means I'm going to actually have some real content now. 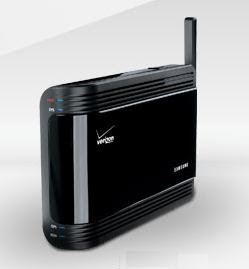 Most exciting project so far is this black router-like device from Verizon. It's called a Femtocell, and it is pretty much a miniature cell phone tower that you plug into your internet connection, and promptly have five bars throughout your entire house. Granted, it cost $270, which is a little outrageous considering that we are now using OUR electricity, and OUR internet connection, to extent Verizon's network, because they couldn't get their act together and get decent coverage (read: any coverage at all) to our house. At the same time though, unlike many other companies, they aren't going to charge us $10 a month to use our power and our internet to help make their network more appealing, to us, so we would want to give them more of our money, which makes me SICK. Anyways, onto this specific product. In a word, it works. Getting it working was litterally a 20 minute excercise in plugging in cables and waiting for the GPS to pick up. To operate, it needs three things: Power, internet, and GPS coverage. The GPS is for the E911 service so when someone is laying in your driveway, and wasn't smart enough to program the local 7 digit emergncy number into their Verizon cell phone, the police will still know where they are, which is very clever. Unfortunately, when the instructions say that you need to put this thing near a window to get GPS service, they're really not being that conservative. It really doesn't work anywhere else. Except, that they're also clever enough to include ~25 feet of coax to allow you to run the GPS antenna (which pops out of the device and who's shape is reminiscent of a USB dongle) out to aa window, so I currently have it running in the dead center of my house with all LEDs blue. The one oddity about it is the bandwidth usage. In different places in the documentation it says it needs 300kbps (37.5kBps), or 40kbps (5kBps). The 300 number caused me some concern, since our internet definitely doesn't get 300kbps up, so if it meant 300 up and down, we were screwed. Luckily, I haven't seen anything even close to 300kbps in either direction, so I have no idea where that number is coming from. The femtocell has 3 standard channels + 1 E911 channel, and from playing with it and watching my router, a single phone call looks to take 6-7kBps in bother directions. Standby bandwidth usage looks to be a 10kB download every 60 seconds, and maybe 3kB up scattered throughout the minute. Pretty much negliable. It definitely suffers from heavy bandwidth usage, such as bittorrent. I haven't gotten around to playing with the QoS settings on our router yet, but as would be expected, bulk traffic and real time traffic just don't mix, end of story. Would I say that this thing is worth the $270 we spent on it? Probably not. Is it worth something remotely close to $270? Definitely! I can sit anywhere in my house and make and receive phone calls, crystall clear (though possible with slightly more lag? Possible just me looking for it). Does it mean our neighboors are freeloading off our femtocell? Possible. I was picked up on it instead of the towers anywhere in our house. I would no be surprised if our immediate neighboors might pick up on it if they happen to be Verizon, but luckily we can set it to give our numbers priority. We still need to do some more range testing for it. UPDATE: After some experimenting, it looks like cells would only *connect* to it from the near half of only one of our neighbors properties. The range of the device was somewhat farther than that, but that was only when the call started closer and then moved away. Note that any call started on a tower will never transfer to the femtocell, possible to prevent passer-bys from randomly connecting to it, only to go out of range again in seconds. Can it only connect one call at a time, or more than one? It can connect three calls + one 911 call at a time. Realistically, our internet can't support more than about two. @wondermnd: I recall reading in the documentation that it doesn't handle any digital traffic, but voice only. I just experimented with it, and it seems like it might handle text messages, so I don't know, and all I can tell you is to ask tech support *eye roll*.